For anyone who is into mountaineering, Aconcagua is a big name. Each year, the highest mountain outside the Himalayas attracts people from all around the world during its climbing season, which goes from November to March. Anyone who is looking for a mountain challenge, sooner or later faces Aconcagua. That is what happened to Oleksii, a Ukrainian living in Dublin. The sporty type and into running, he is always looking for a challenge, call it a marathon or a peak to climb. Mountains were part of his life since his childhood, when he spent several holidays in the area of Mount Elbrus, and summited it at the age of 14. That’s why, since the idea of Aconcagua crossed his mind for the first time, he set all his efforts to make it to the top. Oleksii and Francisca, with Aconcagua in the back. Photo: Oleksii N.
Nido de Cóndores Camp, 5600m. Photo: Gastón Oyarzún. As a preparation, he climbed Kilimanjaro, in Tanzania, three months before going to Argentina. He did ok with the physical challenge, and high altitude wasn’t a problem for him. The next step was the final stretch to make the Aconcagua dream come true. And for that, he needed to find the ideal mountain guide to take him to the top. Here is where mountain guide Gastón Oyarzún enters the picture. Oleski found his profile while browsing on Explore-Share and wrote to him. It was the end of November 2015, and 2 months later they were already meeting in Mendoza airport to go to the ‘Centinela de Piedra’, the Rock Sentinel, as Aconcagua is often called. But Gastón is not just another guide. He is one of the main historic figures in Chilean mountaineering. 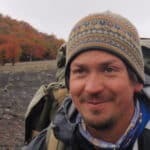 He was part of the first Chilean expedition to the Himalayas in 1979, and when he went with Oleksii, it was his 36th time in the ‘roof of America’. The kind of guy the kids who are getting into guiding look up to, and not only in Chile. This year, he plans to ascend Mount Cho Oyu, one of the 8000 meters peak in Nepal. So that’s not a bad start if you want your experience in Aconcagua to be good. Gastón picked up Oleksii in the airport, and after working out the permits they went straight to Penitentes, the small ski resort where most people spend the night before starting the expedition. They were lucky to avoid a landslide that blocked the road some hours after they passed through, so good fortune was on their side. The group was of 3: Oleksii, Gastón, and Francisca, a student of Gastón who was there as assistant and to learn in the field, and according to Oleksii, was extremely helpful, and a key factor in the success of the expedition. The beginning: the entrance of Aconcagua Park in Horcones. Photo: Oleskii N.
The team facing the final traverse, at 6700 meters. Photo: Gastón Oyarzún. They did a 12-day expedition via the normal route, through Horcones valley and Plaza de Mulas, and following Gastón’s method, who prefers to set the camps at lower altitude, in order to sleep well, and do longer ascents during the day. During the first days they started calmly, in order to get used to the mountain and its altitude. But there was also time to enjoy fantastic dinners, such as salmon and steaks, together with a good local wine. “I was there walking alone, watching the ground, and I had to ignore the voices in my head that told me to stop, to turn back. So I moved on, doing step by step, without thinking in anything else than putting one foot in front of the order, and continue moving. And it was worthy: When I reached the summit, I felt the most powerful emotion in my life”. And the reward was priceless: a 360° breathtaking view of mountains, glaciers, and white fields, with the beautiful figures of peaks such as Cerro Mercedario and Cerro Tolosa. And a feeling of fulfillment that’s only known by those who ever did an effort like that. Relax time in the Base Camp. Photo: Oleskki N.
Oleksii in the summit of Aconcagua. Photo: Oleksii N.
On the way down there was time to relax. They enjoyed and were lucky enough to see condors and guanacos, and had a nice party with pizza and wine in Plaza de Mulas. Oleksii even met some other Ukrainians there! This is what he said: “In places like the base camp you meet many interesting people who are usually all there for the same purpose, overcome a challenge and conquer themselves”. 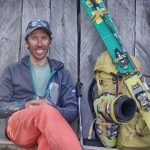 We at Explore-Share are very happy that we were able to help Oleksii to find the ideal mountain guide for him, and reach the top of Aconcagua. It is a huge challenge and a life-changing experience, but as it is not a technical ascent, it’s a dream that can come true if you face it in a serious way, with an excellent preparation, and the proper advice and guidance. Sunset in Aconcagua. Photo: Oleskii N.
Looking for more info about this epic climb in the Andes? 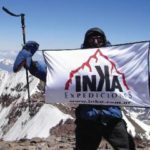 Don’t miss this useful blog post with everything you need to know to climb Aconcagua and learn about routes, climate, difficulty, equipment, preparation and costs. Ready to start planning your trip? Check out all the programs for climbing Aconcagua offered by certified mountain guides in Explore-Share.